REGO-FIX introduced the first ER collet chuck in 1972. 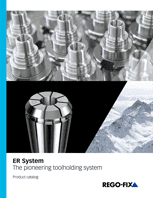 With the DIN standardization twenty years later, the REGO-FIX ER collet became the industry standard. The widest ER product range clamps all diameters from 0.2 mm – 36 mm. Safe and accurate toolholding of all shank types and materials. 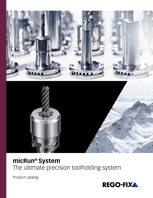 Outstanding flexibility for usewith all tool types. High vibration-dampening results in longer tool life and best surface finish.